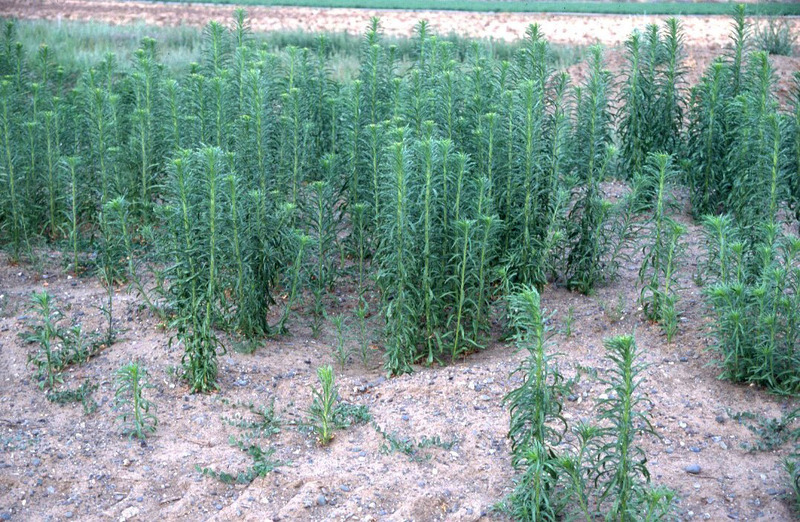 Weed species #2 that we wanted to emphasize this spring is horseweed, also known as marestail. This species has been in Wisconsin for well over a century and has been identified by experts in all but one county (Pierce). Despite this, I rarely see it as the dominant weed species in production fields. It does thrive in undisturbed areas with large amounts of bareground, so I typically see populations in no-till fields, roadsides, and other right of way areas. If you want to find this plant, it is easy to see populations growing along train tracks and roadsides throughout the state. Unique attributes of this plant include its ability to act as a winter or summer annual weed and its ability to evolve herbicide resistance in Wisconsin (glyphosate) and other states (glyphosate, ALS inhibitors, and PS I & II inhibitors). Similar to our previous weed species we emphasized (chickweed) we have seen an increase in populations over the past several years, and I expect to see populations continue to increase in 2017. Click here to download this factsheet. Previous post: How Quickly Can Farmers Plant Corn in Wisconsin?